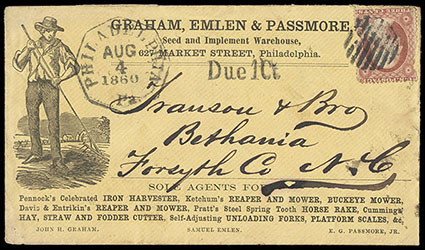 (Agricultural) Graham, Emlen & Passmore, Seed & Implement Warehouse, illustrated ad design showing Farmer with Rake, on cover ranked with 1857, 3¢ dull red tied by grid handstamp, matching "Philadelphia, Pa., Aug 4, 1860" octagon date stamp and "Due 1 Ct" handstamp, with original enclosure; stamp flaws, otherwise Very Fine. 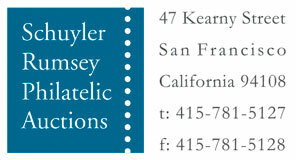 (Agricultural) J.S. 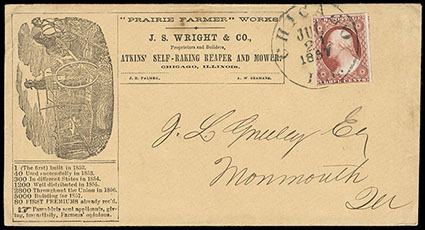 Wright & Co., Proprietors and Builders, Atkin's Self-Raking Reaper and Mower, illustrated ad design on cover showing Horse Drawn Reaper, franked with 1851, dull red tied by 1857 Chicago, Ill. cds, with original letterhead enclosure, Very Fine. 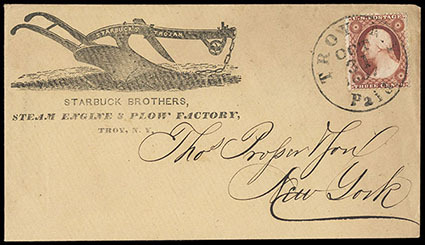 (Agricultural) Starbuck Brothers, Steam Engine & Plow Factory, illustrated corner card showing Trojan Plow, on fresh cover to New York City, franked with 1857, 3¢ dull red tied by "Troy, N.Y., Paid, Oct 31" cds, Extremely Fine. 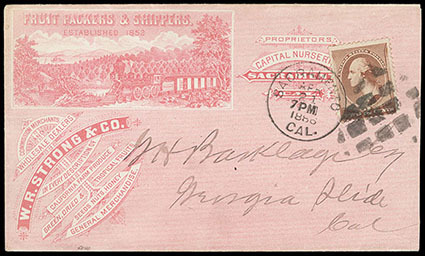 (Agricultural) W.R. Strong & Co., Fruit Packers & Shippers, Sacramento, Cal., pink illustrated ad design showing Locomotive Traveling Through Orchard, on 1886 cover franked with 2¢ Banknote tied by "Sacramento, Cal., Apr 21, 1886" cds and segmented grid handstamp; slight reduction at right, Very Fine. Scott No. 210 Estimate $100 - 150. 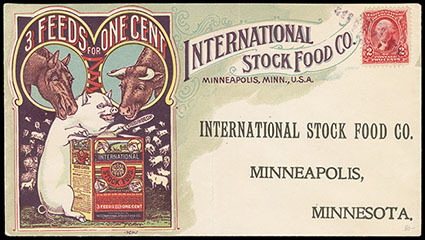 (Animal) International Stock Food Co., 3 Feeds For One Cent, Minneapolis, Minn., multicolored illustrated designs on two covers; one showing Horse, Pig and Cow with 3 Feeds Bucket, other showing Horse, Pig & Cow Logo on Bucket, both franked with 2¢ red (one perfin), each with additional ad text on reverse with factory views, one with order enclosures; former with file fold, Very Fine. (Art & Photography) Chas. 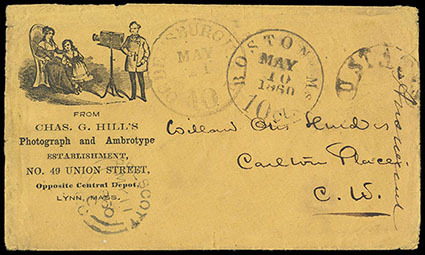 G. Hill's Photograph and Ambrotype Establishment, Lynn, Mass., illustrated corner card design showing Photographer with Women and Child, on cover to Carleton Place, Canada, "Boston, Ms., 10 cts., May 10, 1860" integral rate cds and Ogdensburgh exchange with arched "U. 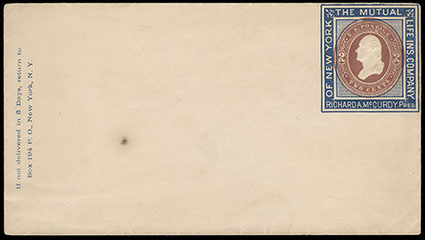 States" handstamp, transit and receiving backstamps; some light edge wear, Very Fine. 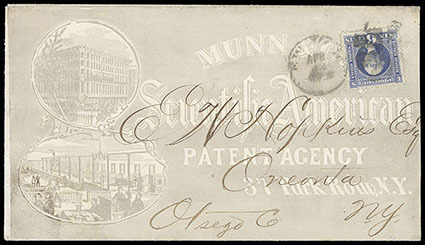 (Attorney) Munn & Co., Scientific American Patent Agency, gray allover illustrated ad design showing Building and Office Views, on double rate cover franked with 1869, 6¢ ultramarine tied by New York cds and cork duplex, Very Fine; with 1986 P.F. certificate. Scott No. 115 Estimate $400 - 600. 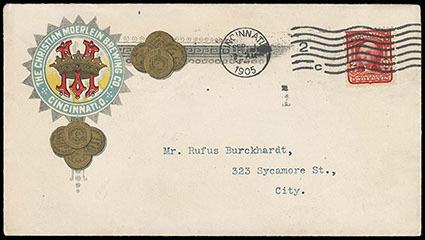 (Brewery) The Christian Moerlein Brewing Co., multicolor advertising corner card showing Crown Logo and Award Medals, on 1905 cover franked with 1903 2¢ carmine tied by Cincinnati, O. machine cancel, multicolor Logo & Beer Label printed on reverse, Very Fine, a scarce design. 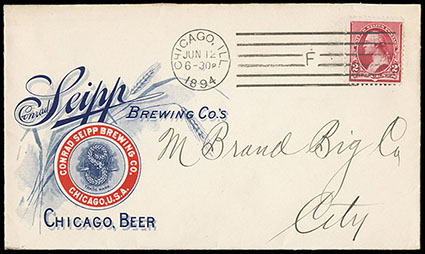 (Brewery) Conrad Seipp Brewing Co., Chicago, bicolor design showing Logo and Wheat Motif, on fresh cover franked with 1890, 2¢ carmine tied by 1894 Chicago, Ill. machine postmark, Very Fine and choice.